On constitutional jubilees, narratives, books and other causes for celebration and concern. On one of the world’s most rotten constitutions and other things we learned travelling in Bosnia-Herzegovina. On the hammering of Britain, EU triumph and the danger of excessive constitutional rigidity. On Brexit, the Westminster model and other precipitous matters constitutional. On Venezuela, Hungary, Poland and other risky but interesting parallels in constitutional law and policy. On politics and constitutional politics and the difference between both. On coalitions, conventions and other matters for constitutional pharisees to wrap their head around. On stripping Germans from being Germans and other more or less existential matters constitutional. Court-Packing On the Table in the United States? Surprising many Establishment-oriented commentators and legal scholars, several candidates seeking the Democratic Party’s presidential nomination have endorsed – or at least have expressed willingness to think about – “Court-packing,” that is, increasing the number of Supreme Court Justices to offset the control Republicans gained by what Democrats regard as unfair tactics. The elections to the European Parliament will take place in a few weeks’ time. There is a clear danger that some of the new MEPs will gain their mandates in elections organised by Member States that are not up to democratic standards. The European Parliament should try to defend itself from being infiltrated by MEPs with questionable democratic mandates. It already possesses the competence which is necessary for it, in the form of mandate validation. Same same but different: After last week’s general election in Thailand, chances are high that the distribution of political power in the country follows this popular saying. The junta stays in charge but can repackage its authority with democratic labels: same authority, different disguise. 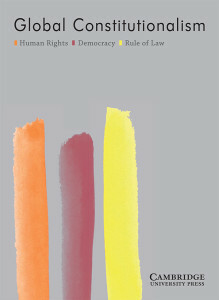 On December 12th 2018 the State Council Information Office of the People’s Republic of China (PRC) published a white paper (WP) titled ‘Progress in Human Rights over the 40 Years of Reform and Opening Up in China.’ The paper, which seems to be targeting more foreign audience than a domestic one, reflects upon the progress China has made in the field of human rights since Deng Xiaoping’s liberalization and opening up reforms that began in 1978.